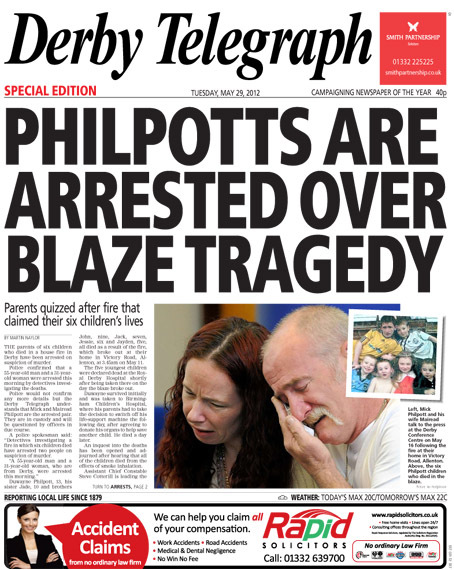 The Derby Telegraph printed its third special edition in the space of a month today as two people were arrested over a fatal house fire in the city that killed six children. A 55-year-old man and a 31-year-old woman – believed to be the children’s parents Mick and Mairead Philpott – were taken into police custody earlier today. As well as covering the breaking story on its website, the Telegraph published an on-the-day edition with a print run of 5,000. Earlier this month it printed 10,000 copies of a late edition on the day of the tragic blaze, having also produced a 4 May election special after the city council changed hands. The Philpotts were arrested early to mid morning – so the old Evening title – now another morning paper – had to scramble to get the news out to its dedicated readers with a “special”. Good on the Derby Telegraph for running with the story and trying to boost sales at every opprtunity. But the truth is, we would expect nothing less from adept and seasoned journalists. In the “bad old days” , this story would have gone into four or five editions without anyone batting an eyelid. Now we rely on so-called “sopecial editions” or breaking the news (for free) to readers who don’t subscribe to Apps, or even have a computer, let alone an iPad tablet. No wonder regional titles are losing sales, editors are being culled quicker than their disappearing staff, and the regional groups have no idea how to replace their dwindling advertising revenues online. Hell in a handcart? Well, put it this way, Derby have a better chance of winning promotion next season than we have of surviving the next decade.